Making homo sapiens the dominant species on the planet. It is this story that underpins such statements as “it’s the economy stupid” or the purpose of business is exclusively to make sound financial returns to shareholders. It is this story that insists the economy can and should grow forever and that recognises success as material acquisition; access to power or celebrity. This story did work – for a while. But it is now unraveling. It has, to use a modern phrase, outlived its “sell-by-date”. It has within it a fatal flaw that will cause a replacement to emerge. We’re living at that time in human history when we can consciously help shape a New Story that respects the awareness and knowledge created by the Old; that dips into the perennial indigenous wisdom that preceded it; and fuses to create a New Story fit for our times. This is not time for finding fault, blaming or finger pointing. The past was likely an important part of our development and many of our past achievements have created the jumping off point from which we can leap forward. It is a time though for us each in our own way to contribute towards a new story that, to repeat Buckminster Fuller, renders the old obsolete. The emerging New Story, like all stories based on ancient wisdom, acknowledges the necessity for attaining a balance between three variously-named elements: body, mind and spirit; the physical, mental and spiritual while also respecting the underlying three stages that all Life experiences; birth (the journey from whence it came); life (the experience of being here now); and death (our passage back home to our source). Such thoughts arise naturally when sitting in an exquisite Balinese compound adjacent to a family temple where my host’s family is enjoying timeless conviviality and companionship preparing offerings to the spirits that sustain such a balance. 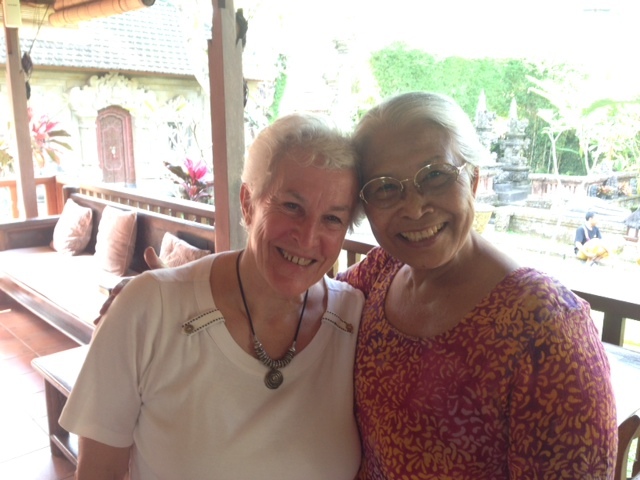 The Role of Bali in Conscious Travel It is fitting that I should find myself in Bali again as this is the place where my first awareness of the reality of this holy trinity was first awakened. Balinese society is a full expression of Tri Hita Kerana – living in a balanced relationship with God (Parahiyangan), Nature (Palemahan) and Community (Pawangan) – another three some! Here all life is animated and sacred; nature is art; and life is ceremony. 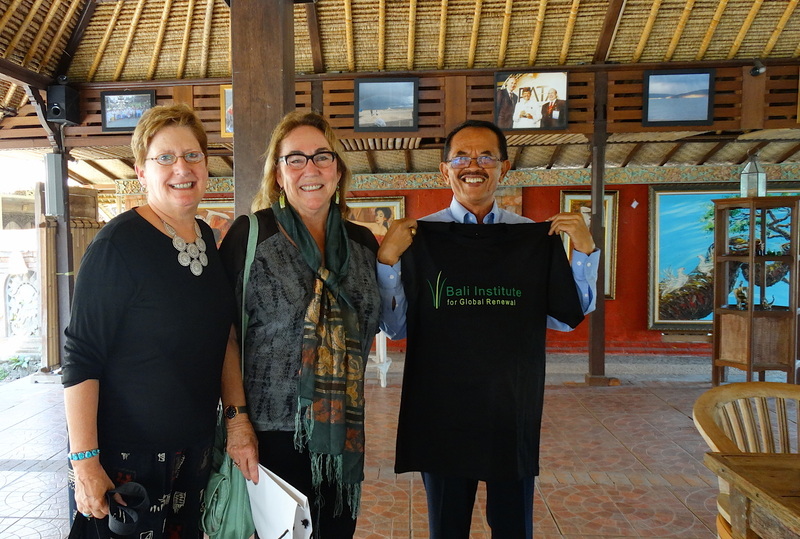 I am here at the invitation of the Bali Institute, established to foster a deeper appreciation of other cultures among young students and to develop ways of assisting Balinese youth take pride in their culture and find ways of developing livelihoods that that sustain and enrich rather than demean and undermine. 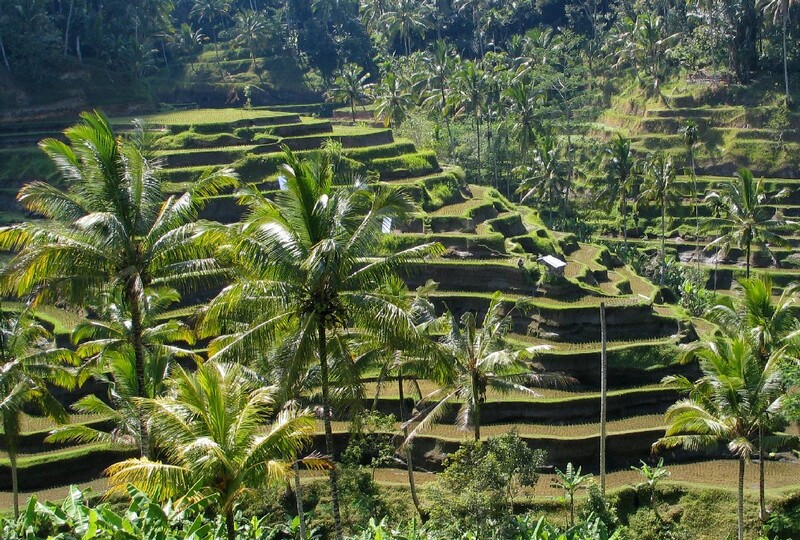 If the task of modern man is to return to a right relationship with nature; to recognize that our role is not to have dominion over or exploit nature’s abundance; and to act as mindful stewards maintaining balance and preventing a descent into disorder and decay, then Bali has so very much to teach us and is the ideal place to learn. Agung Rai, who has created an award winning ARMA museum and resort on the edge of his village Peliaten on the southern edge of Ubud that sustains the livelihoods of over 120 people. 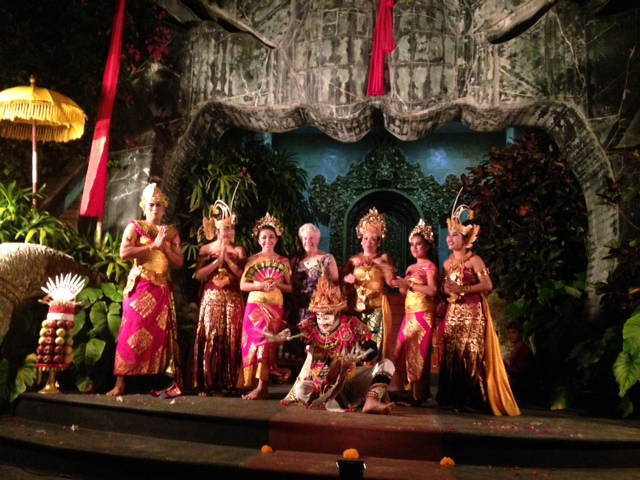 Gung Rai began by selling paintings to visitors on the beach in Kuta in 1973 – the place and time of my first visit. It too is highly likely that our paths crossed then. 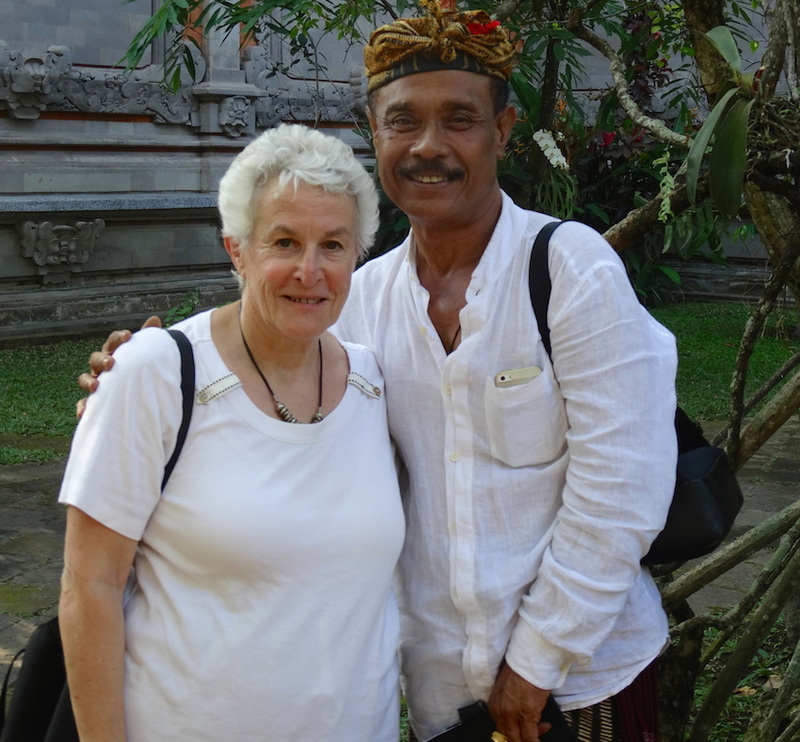 His achievements since are nothing short of staggering – having built an award winning resort, art gallery with a notable collection of Balinese art, two coffee shops and a Foundation that support local children learning to express their culture through all kinds of artistic media. He is deserving of close attention by any interested in the ways tourism can yield tangible net benefits to all engaged. Agung Prana has also been responsible for proving that local communities, located on the sea’s edge, can regenerate and restore coral reefs and indigenous fish for the future benefit of future generations. The innovative “bio rock” technology was applied in Pemuteran, and after only a few years since the first structure was installed, results are amazing. Corals grow fast and healthily, fish life is abundant, invertebrates like crabs, sea slugs and shrimps are abundant and occupying every shelter inside the Biorock. This video of the work undertaken in partnership between German firm, the Permuteran Foundation created by Agung Prana and the village community inspires me with hope for the future of Bali and all communities that live near the sea. http://www.youtube.com/watch?v=Rx8TV9Kd0ns I’ll be staying at the Puri Taman Sari resort tomorrow, attending a Facilitative Leadership workshop thanks to Linda Dunkel, CEO, Marcia Jaffe, Chairman of The Bali Institute of Global Renewal. Plans for a Learning Community, involving the village and guests form elsewhere, that fosters transformative learning and deep cultural exchange are underway for the village surrounding the Puri Taman Sari resort. I will share the stories of each host in subsequent posts as I get to know these inspiring individuals better. The Balinese are naturally modest and reluctant to “sound their own trumpet” but that’s no reason for those of us, who have been privileged to experience their commitment to achieving balance, to refrain from telling their story and supporting their efforts.